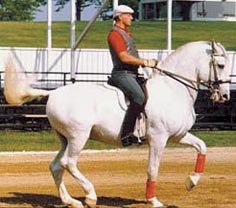 Correct execution of the volte as outlined in these patterns takes even the best horse and rider years and even a lifetime commitment before perfection is achieved. Correct bending must be performed with utmost precision since equal to bending towards the inside of the horse’s body, is the stretching of the outside. These two charts carefully illustrate the perfect position for the classically executed bend.